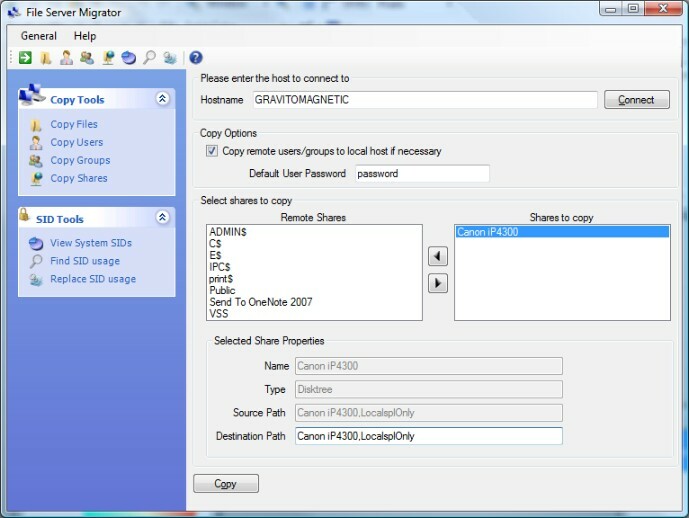 File Server Migrator is a powerful data migration tool. Copy local users, local groups and their membership between remote hosts. Will automatically copy these objects as encountered in security and audit permissions. Copies creation time, last access time, last write time of files and directories. Copies read, archive, system and hidden attributes of files and directories. Copies all file and directory security permissions exactly as defined on source object. Copies all file and security auditing rules exactly as defined on source object. Before importing local users and groups, it will try to reuse them if already existing (by name) on the target machine. Gets a list of all machine, user and group Security Identifiers defined on a local machine. Automates the copying of data between Windows NT/2000/2003/2008/XP/Vista. A MyWebServer accessy extracts uploaded files from their mime wrappers. Qweas is providing links to File Server Migrator 1.3 as a courtesy, and makes no representations regarding File Server Migrator or any other applications or any information related thereto. Any questions, complaints or claims regarding this application File Server Migrator 1.3 must be directed to the appropriate software vendor. You may click the publisher link of File Server Migrator on the top of this page to get more details about the vendor.